Round 1 of the inaugural National Rugby League season in 1998 could kick off no other way. 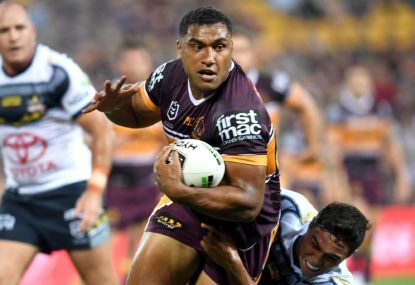 Surely, there was no better clash to open the first round than a battle between the respective champions from the previous year – Super League titleholders the Brisbane Broncos against ARL grand final winners Newcastle. Apparently, someone in charge thought differently, for the Knights opened up their campaign against the North Sydney Bears, while the Broncos took on fellow competition heavyweights the Manly Sea Eagles. 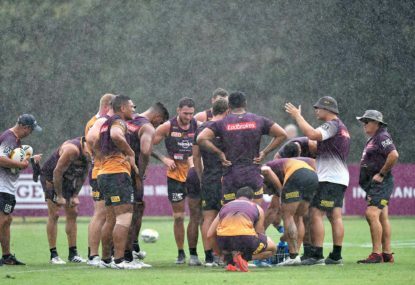 In fact, the much-anticipated ‘clash of the champions’ didn’t take place until Round 8, with Brisbane winning comfortably to the tune of 26-6. Although this little tidbit is undoubtedly forgotten by a large portion of rugby league pundits, and indeed seems rather uninteresting on paper, it is indeed far more symbolic than it may first appear. Here were two heavyweights of the competition, defending champions in fact, both established in the same year – 1988 – who seemed to have the stage set for a mouth-watering battle, only to have the rug swept out from underneath them, and their encounter relegated to a platform, or time of the season, not exactly fitting of its blockbuster status. And so tells the story of the Brisbane Broncos versus Newcastle Knights feud of the late 90s and early 2000s. In most cases, rugby league has a funny way of giving fans just what they want, and creating a promotional dream for the NRL. Take, for example, the 2004 NRL grand final. In 2002, the Bulldogs were stripped of 37 Premiership points and taken out of the finals race after having won a club record 17 consecutive games en route to a certain minor premiership. That same year, the Roosters ended up winning the grand final. Cue taunts of ‘fake champions’ from outraged Bulldogs fans. Over the course of the next two years, the two clubs would engage in some of the most intense encounters of the season, both on the field and in the grandstands. So when both teams met in the 2004 decider, it was already shaping to be one of the most memorable grand finals in history before a ball was even kicked. 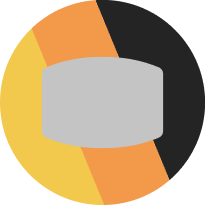 There are countless other examples of adversarial heavyweights who defined their rivalries on the game’s greatest stage; but the one grand final which the game deserved perhaps more than any other at the time – the Newcastle Knights versus Brisbane Broncos – never happened. The fact that both teams won competitions in the same year – ten years after each team entered the comp – was merely the spark which ignited the flame of their rivalry, as both teams established themselves as powerhouses of the competition whose successes seemed to parallel each other. Yet somehow, for all their dominance during this period, their respective courses never collided on the biggest stage. In the aforementioned 1998 season, the Brisbane Broncos maintained their dominance from the previous year as they finished the season as minor premiers. Following closely behind, and only then on for and against, was – you guessed it – the Newcastle Knights. While many thought that the season finale would indeed be a meeting of the previous season’s champions, such a clash never eventuated as the Knights were bundled out of the Finals following consecutive defeats to the Roosters and Bulldogs. Brisbane, meanwhile, galloped their way to the grand final, where they defeated the ‘Dogs 38-12 to capture their fourth Premiership. While many gave the Bulldogs plaudits for their courage in making it to the grand final considering they had entered the ten-team finals series in ninth place, by all rights that spot should have gone to Newcastle had they not squandered their own opportunities. It wasn’t the closest we would come to a Brisbane-Newcastle grand final, however. By 2000, both Newcastle and Brisbane could lay claim to fielding outfits which had arguably the best players in the world in their respective positions. At the top of the heap was Andrew Johns and Darren Lockyer, two legendary players who defined a generation in rugby league and were at the peak of their powers at the turn of the century. Throughout the season, it seemed only inevitable that both teams would ultimately meet in the decider as they – along with the Sydney Roosters – proved themselves as the dominant sides in the competition, no surprises given the talent included in both teams. In retrospect, this season would also be the closest both sides would come to meeting in a grand final. In the first preliminary final, Brisbane earned their way to the grand final following a gutsy 16-10 defeat of Parramatta. In their preliminary final match against the Roosters only a day later, the Knights seemed home as they walked into the sheds at halftime with a 16-2 lead. Astonishingly, the tricolours emerged victorious following a courageous comeback. The following season was the same story, only in reverse. After winning the 2000 Premiership, Brisbane once again found themselves in the preliminary finals alongside Newcastle. 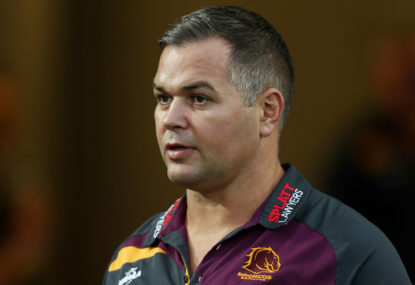 However, this time it would be the Broncos who were eliminated while the Knights qualified for the grand final, and ultimately won the Premiership. By 2002, the rivalry had developed into something of a mini ‘State of Origin’, with both clubs fielding multiple representatives for their respective states. 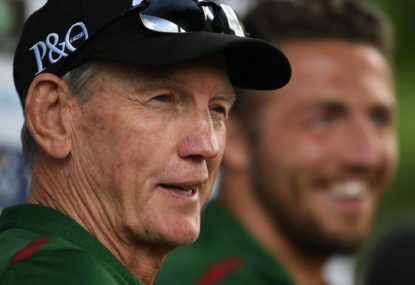 In fact, the mid-season test between Australia and Great Britain saw nine players take the field for the Kangaroos who played for either the Knights or Broncos. Yet for all their success in the representative arena, neither side was able to convert it to results at club level. Although it seems a relatively trivial subject matter on which to write an article, the fact we never had a Newcastle versus Brisbane grand final during this period represents more than just poor timing or missed opportunities, but also the effect success and overwhelming pressure can have on a club.